St. Patrick's Athletic edged out Dublin rivals Shamrock Rovers 3-1 on penalties in a thrilling and open EA Sports Cup game at Richmond Park on Easter Monday. Stephen Bradley, John Flood and Evan McMillan all converted from the spot to see Pat's safe progression to the next round. Rovers thought they had done enough to edge the tie as they lead through a Ciaran Kilduff penalty, with only two Minutes to go. However, Pat's remained competitive to the death and got their just reward when Danny North fired home a penalty to send the sides into extra time. Michael O' Neill and Pete Mahon both used this EA Sports Cup 2nd Round game to experiment with their teams, with the two sides showing multiple changes from their last league outings. It was Pete Mahon's men who started much the brighter with both Neil Harney and Ian Daly going close early on. Indeed the hosts dominated the opening spells and Rovers didn't record their first serious effort on goal until the 24th minute. The impressive Paddy Kavanagh ran through the Pat's cover before firing from the edge of the box, but Pats keeper Chris Bennion saved well. Kavanagh and Pat's striker David McMillan traded efforts before Pete Mahon was forced to make his first substitution as Shane McFaul replaced the injured James O' Brien in the Pat's midfield. And the substitute had a chance to put the host one up just before the break but his powerful effort went just over Ryan Thompson's cross bar. The game resumed at a much slower pace after the restart. Kavanagh continued to ask questions of the Pat's defence. However it was the Saints who had the first real chance. A wonderful flowing move, started off by full back Neil Harney, eventually allowed Sean Stewart space to shoot in the Rovers box. Thompson saved from a tight angle in the end. Rovers looked dangerous on the break and it was a counter attacking move that brought the first goal. A long ball found Rovers frontman Ciaran Kilduff in the box. Goalkeeper Chris Bennion came rushing out to meet the striker and upended Kilduff in his efforts to get the ball. Bennion guessed correctly for the penalty, but couldn't stop Dean Kelly's powerful effort. To their credit, the home side continued to fight and should have got themselves level ten minutes after the goal. Rover's substitute Jeff Flood completely missed the ball in his attempt to clear the danger. Ian Daly picked up possession on the edge of the Rovers box but his ambitious lob was picked out of the air by Ryan Thompson. 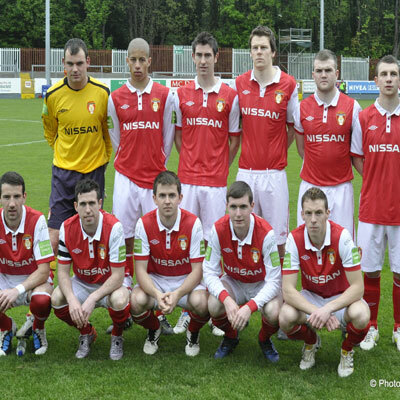 Mahon rang in the changes soon after, replacing his strike force with Daniel North and John Flood. North had a decent shot from 18 yards out with ten minutes to play but the effort whistled past Thompson's right post. Only five minutes later North was involved again when he was needlessly brought down by Jeff Flood in the Rovers box. Referee Rob Rogers had no hesitation in pointing straight to the spot. North fired home to force extra time. Michael O' Neill made his final substitution as Paul Connolly was introduced for the impressive Sean Byrne. Despite the fresh legs however, it was Pat's who looked the more likely to score. Stephen Bradley thought he had done just that a minute before the break but his free kick bounced off the top of the cross bar. The second half played out without any major incident as the dreaded penalty shoot-out beckoned. Rovers got off to a nightmarish start missing their first three penalties. Conor McCormack did put his effort away, but in the meantime, Stephen Bradley and John Flood had both found the back of the net. Pat's hopes of progression rested on defender Evan McMillan. He thumped his effort past Ryan Thompson to the delight of the home crowd. On balance, a Pat's victory was probably deserved, but Michael O' Neill will know his side had enough chances to kill off the tie before North's late effort.